Salmon sushi meets Hawaiian poke with this sweet and spicy bowl of rainbow-coloured goodness. to garnish: sesame seeds, pickled ginger, lime wedges and cilantro, all optional. Make the sauce: Whisk or shake together all ingredients in a small jar. Arrange the lettuce in the bottom of a bowl, using some leaves to line the sides. Prepare all remaining ingredients as indicated above. In a small bowl, combine the cucumber, mango and avocado. Pour it into the lettuce-lined bowl, followed by the julienned carrot and shredded purple cabbage. 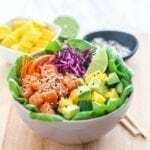 In the same bowl you mixed the cucumber, mango and avocado in, toss the sushi salmon cubes in about 1 tbsp spicy sauce. Add the cubes to the poke bowl. Drizzle lime juice over top if desired and sprinkle with sesame seeds. Serve with optional garnishes and remaining spicy sauce on the side.